It is happening for "no apparent reasons", scientists say, but the comet Schwassmann-Wachmann 3 has been rapidly breaking apart, provoking another round of second-guessing by astronomers. The images above, captured by NASA's Hubble Space Telescope, are the best pictures yet of an event that has astronomers scratching their heads. The comet Schwassmann-Wachmann 3, otherwise known as Comet 73P, is disintegrating in front of their eyes. But what is the cause of this extraordinary event? Not one of the theoretical surmises offered so far has satisfied the community of astronomers as a whole. From all standard vantage points such an event presents inherent - some would say insurmountable - dilemmas. Schwassmann-Wachmann 3, first observed in 1930 and named after its two German discoverers, completes an orbit every 5.4 years. Following its discovery it was little more than a footnote in comet science until 1995. The first appearance of the comet that year was so bright that astronomers hailed it as a new comet. But as it turned out, the "newcomer" was Schwassmann-Wachmann 3, presenting itself in more glorious dress than ever before, despite the fact that conditions were not favorable. It was 150 million miles away, but shining hundreds of times more brightly than expected. In early 1996 astronomers discovered that the comet had fragmented into at least three pieces, an occurrence clearly linked to the spectacular brightening, though no one could say what caused the event. It also appeared as if one or more of the pieces was breaking into secondary fragments. When the comet returned in 2000 it was again brighter than expected, with indications that the disintegration was continuing - or even accelerating. And now, with its most recent appearance, the best Hubble images show dozens of fragments, suggesting the possibility of complete dissolution in a single remaining passage around the Sun. Meanwhile, the "explanations" proposed for the comet's catastrophic fate can only diminish confidence in today's comet science. Even in the face of falsifying discoveries, the specialists appear unwilling to reconsider their theoretical starting point. "It's like pouring hot coffee into a glass that's been in the fridge. The glass shatters from the shock". But there is no rational comparison of the two phenomena. Any explanation by resort to "thermal stress" must provide for heat transfer rapidly through thousands of feet of insulating material, something inconceivable even if you ignore the deep freeze of the vacuum through which the comet is moving, with its sunward face continually changing due to rotation. "The most likely explanation is thermal stress, with the icy nucleus cracking like an ice cube dropped into hot soup". All that this "explanation" requires is a little home experiment. The ice cube will not shatter explosively, or any way display effects comparable to the disintegration of Schwassmann- Wachmann 3 - not even if dropped into boiling water. It will melt. And no matter what a comet is composed of, the heat transfer the "theory" implies for a mile-wide solid object is beyond all reason. "They can also fly apart from rapid rotation of the nucleus, or explosively pop apart like corks from champagne bottles due to the outburst of trapped volatile gases". But the centrifugal forces acting on comet nuclei are close to zero. And to posit heating in the middle of a mile-wide dirty ice cube is, again, scientifically indefensible. Perhaps then, Schwassmann-Wachmann 3 "was shattered by a hit from a small interplanetary boulder?" offered one of the astronomers quoted above. "But make that a series of one-in-a-trillion hits", mused a critic of today's comet science. "That way we can explain the continuing fragmentation over years". "reveal which of these breakup mechanisms are contributing to the disintegration of 73P/Schwassmann-Wachmann 3". Neither NASA, nor the Hubble folks in particular will find evidence for any of the "hypotheses" offered, say the electrical theorists. From an electrical viewpoint the periodic breakup of comets is no surprise. 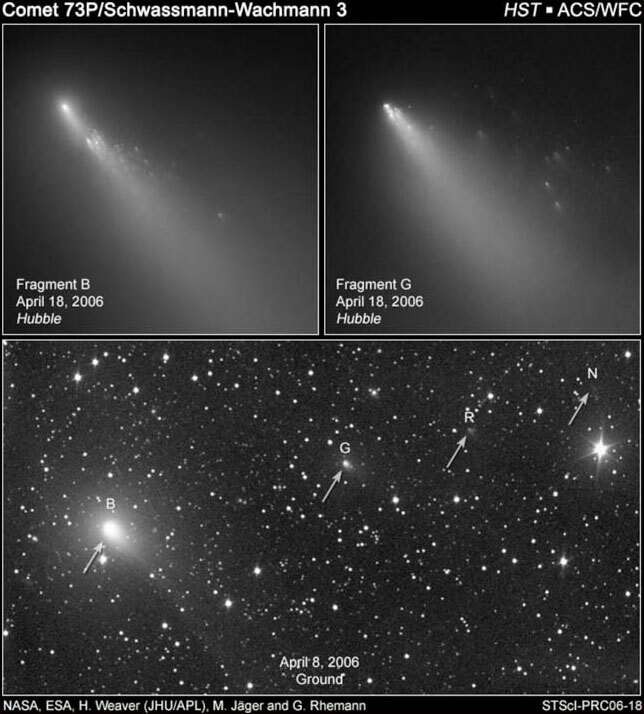 Fragmentation and disintegration illustrate the same dynamic forces observed in the "surprising" outbursts of comets. Electrical outbursts and complete disintegration are merely matters of degree in a discharging or exploding capacitor, which is exactly what an "active comet" is in the electrical interpretation. A capacitor, one of the most commonly used devices in electrical engineering, stores electrical charge between layers of insulating material. And that is what a comet moving through regions of different charge will do - it will store electric charge. A comet nucleus can be compared to the insulating material, the dielectric, in a capacitor. As charge is exchanged from the comet’s surface to the solar "wind" (actually an electrically active plasma), electrical energy is stored in the nucleus in the form of charge polarization. This can easily build up intense mechanical stress in the comet nucleus, which may be released catastrophically. And just as a capacitor can explode when its insulation suffers rapid breakdown, a comet can do precisely the same. "comets break up not because they are chunks of ice 'warming' in the Sun, and not because they are loose aggregations of smaller bodies, but because of electrical discharge within the nucleus itself". Schwassmann-Wachmann 3, first observed in 1930 and named after its two German discoverers, has never put on a spectacular display comparable to such "Great Comets" of the twentieth century as Halley, Hale-Bopp, and Hyakutake. It is a short-period comet: for electrical theorists that means a lower-voltage comet - and, as a rule, less drama. Schwassmann-Wachmann 3 completes an orbit every 5.4 years. Its path takes it from just beyond the orbit of Jupiter to inside the orbit of Earth. But it does not visit the more remote regions of the solar system, while the spectacular "Great Comets" spend long periods adjusting in that more negative environment of the Sun's domain before racing sunward. What Schwassmann-Wachmann 3 does exhibit, however, is a highly elliptical (elongated) orbit, so in electrical terms that means more rapid transit through the Sun's electric field and more intense stresses on the capacitor than would be the case were the comet moving on a less eccentric path between the regions of Jupiter's and Earth's orbits. The comet is presently headed toward perihelion, or closest approach to the Sun (within 87.3 million miles), on June 6, 2006. Well before then, on May 12th it will pass within 7.3 million miles of Earth. Though that is roughly 30 times the distance of the Moon from Earth, many earthbound and space telescopes should capture images of the comet in sufficient resolution to provide additional critical tests of the electrical model.